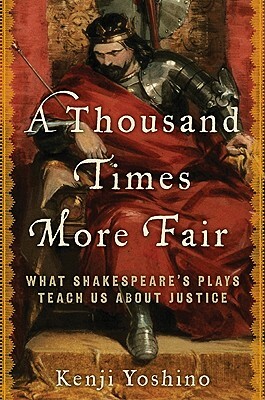 A Thousand Times More Fair is a highly inventive and provocative exploration of ethics and the law that uses the plays of William Shakespeare as a prism through which to view the nature of justice in our contemporary lives. Celebrated law professor and author Kenji Yoshino delves into ten of the most important works of the Immortal Bard of Avon, offering prescient and thought-provoking discussions of lawyers, property rights, vengeance (legal and otherwise), and restitution that have tremendous significance to the defining events of our times—from the O.J. Simpson trial to Abu Ghraib. Anyone fascinated by important legal and social issues—as well as fans of Shakespeare-centered bestsellers like Will in the World—will find A Thousand Times More Fair an exceptionally rewarding reading experience. Kenji Yoshino, Chief Justice Earl Warren Professor of Constitutional Law at New YorkUniversity School of Law, is the author of the award-winning memoir Covering. He lives inNew York City.